In the past, I’ve never really bothered much to concern myself with social consciousness with regards to food and waste. I don’t think you could blame me too much though, because I had never before lived in a place where it was such a high concern or integrated part of the cultural fabric. As it turns out, just being in San Francisco pretty much forces you to become very aware of the impact your consumption has on the environment simply through the requisite use of separate trash, recycling, and compostable bins everywhere you go. Beyond waste management though, I’ve learned you can further be accountable for your actions by the types of meat, seafood, and produce you buy. By choosing responsibly sourced, environmentally friendly meat, seafood, and produce at your grocery store you can be sure the stuff you love so much stays around for a long, long time. And even beyond home shopping, there are ways to make good choices when you’re dining out. 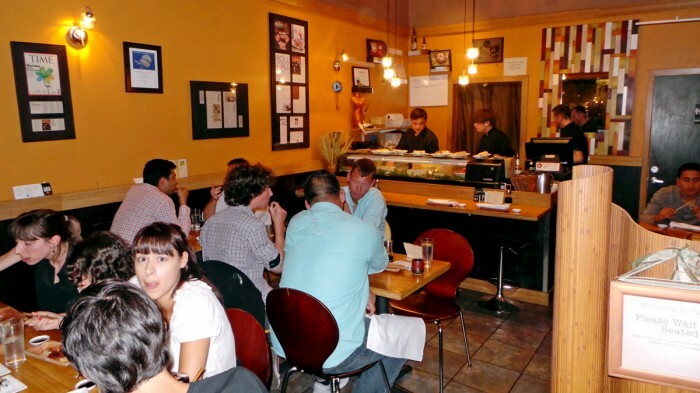 For instance, when the desire for awesome sushi strikes, you can choose to go to a place like Tataki in Lower Pac Heights that refuses to serve any sushi made with anything but sustainably sourced fish. I know, I know. I can hear you groaning already. Sustainability? Social consciousness? What happened to Winston when he moved out to Cali?? Don’t worry, it’s the same old bacon-loving me, I’m just embracing living in San Francisco and trying to learn as much as I can. Trust me, this sushi tastes just as good as the unsustainable alternative and doesn’t even cost more than the quality stuff you’re used to. 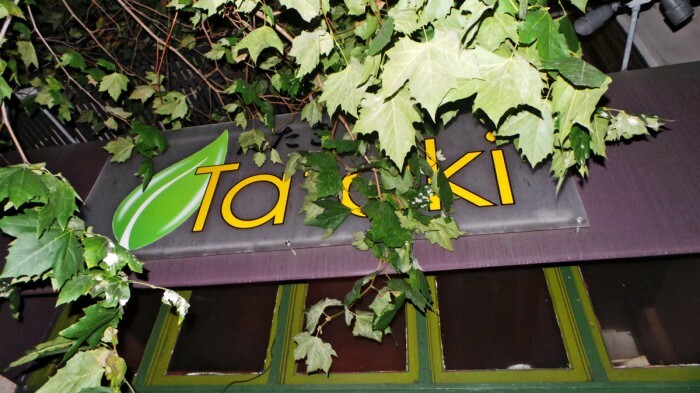 Tataki, I’ve learned, was the first sustainable sushi restaurant in the U.S. and has gotten quite a lot of press and accolades for their pioneering. And that’s why I was there, to see what the hub-bub was all about. Word on the street was that the fish was excellent, but I had to try it for myself to be sure. Just beware that Tataki is Manhattan-sized (ahem, minuscule) and is jam-packed with more tables than they should cram in there. They also function at a frantic break-neck pace. It’s as tightly packed and hectic as any of the more cramped places I’ve dined at in NYC and that’s saying something. But that’s enough of that, let’s talk about the food. Amy and I originally went out for sushi that evening with the intention of trying to make healthy eating decisions so we restrained ourselves and averted our gaze past all of the delicious sounding deep-fried sushi roll creations and went straight for the restaurant’s namesake — the Tataki Deluxe platter. 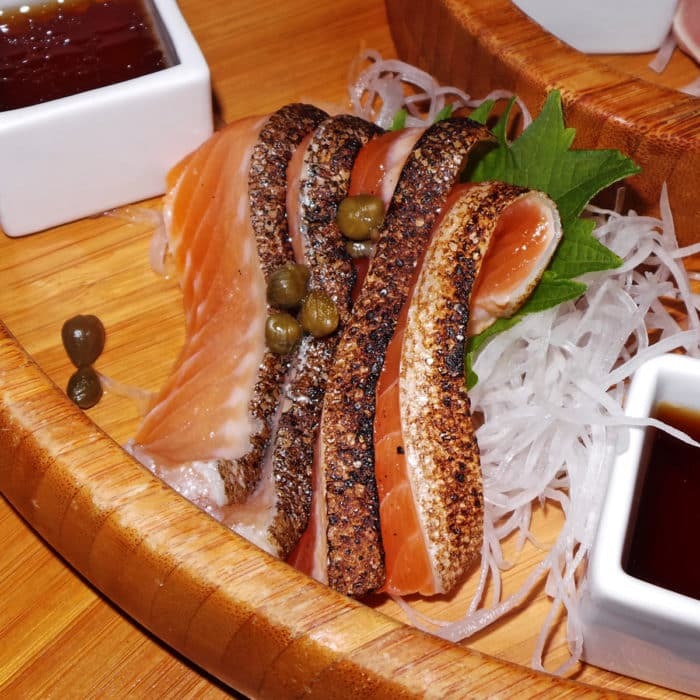 The word tataki just means that the fish is prepared with a light sear on the outside, so this platter unsurprisingly contained a variety of fish slightly cooked in that manner. In short, every piece was spectacular and was thoughtfully paired with its own accompanying sauce, though I’ll admit I preferred certain cuts of the fish more than others. 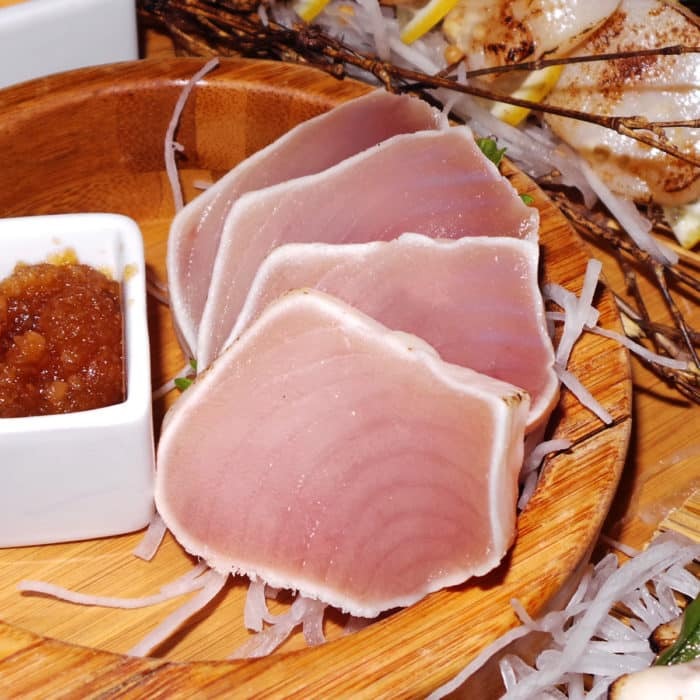 We started at the center of the platter with the pink toned Bincho which is more commonly referred to as albacore tuna. The texture of that fish was absolutely dreamy. 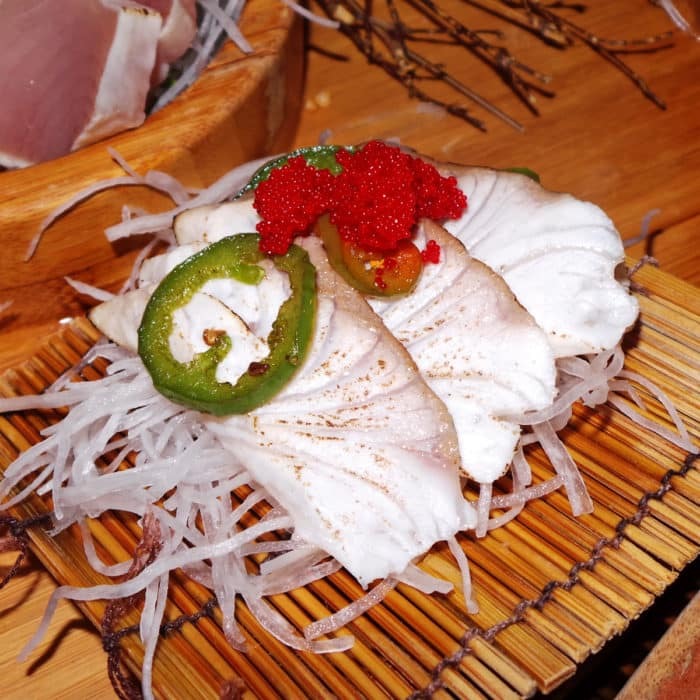 It was extraordinarily fresh and came served with a wonderfully chunky garlic ponzu sauce that was ridiculously delicious when applied directly to the silky raw fish. If this is what sustainable sushi is all about, then I can definitely get on board. Then we shifted over to the Hotate – or raw scallops. 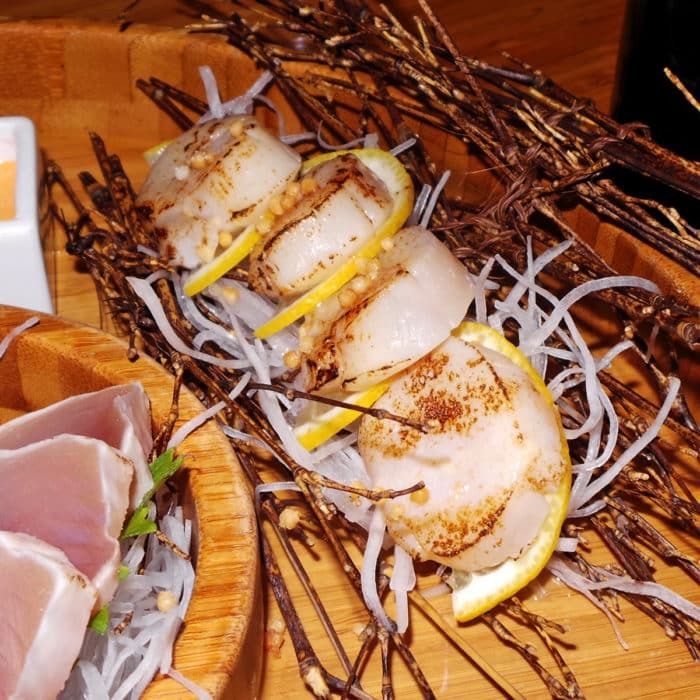 I’ve been really into raw scallop sushi and nigiri lately due to its amazingly delicate tender texture and slightly sweet oceany flavor and Tataki’s version treated the beautiful shellfish with careful expertise. These lightly seared Hokkaido scallops were layered with razor-thin lemon slices and were topped little rice cracker spheres which added a nice crunchy texture to each bite. This tataki was served with a creamy citrus aioli which I found really interesting and quite enjoyable when applied to each scallop. Next we went for the Sea Bream as known as Kurodai which I think was cooked slightly further than the rest of the seared fish. It was topped with avocado, jalapeño ponzu, and habanero masago which were all very nice and flavorful spicy toppings, but this fish just wasn’t as buttery or luscious as the others. I think this one was just cooked a little too far past ‘seared’. On the other hand, the Arctic Char known as Iwana was spectacular. The preparation felt like a little nod to the traditional Jewish bagel and lox by scattering capers onto the outstanding salmon substitute. It also came with a delicious citrusy yuzu reduction sauce which paired nicely with the high-quality orange fish. Certainly, I wanna (pun intended) go back for more of this wonderfully buttery skin-on fish. 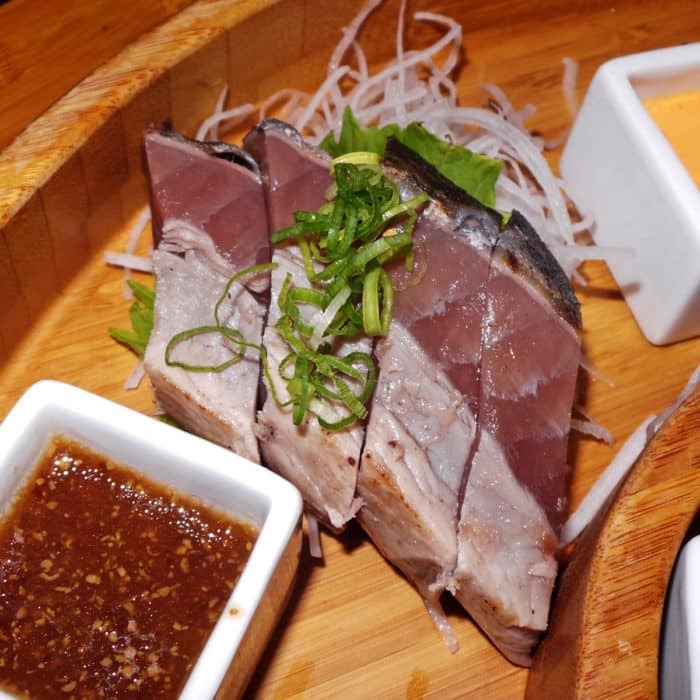 The final tataki was Katsuo aka Skipjack Tuna which was dressed with red onion and served with a sweet mustard. This fish had a deep dark blueish color and was perhaps a stronger flavored fish than the others, hence to bolder flavored mustard sauce. This was definitely some of the best dark-colored raw fish I’ve ever felt or tasted and was a nice way to round out the tataki platter. 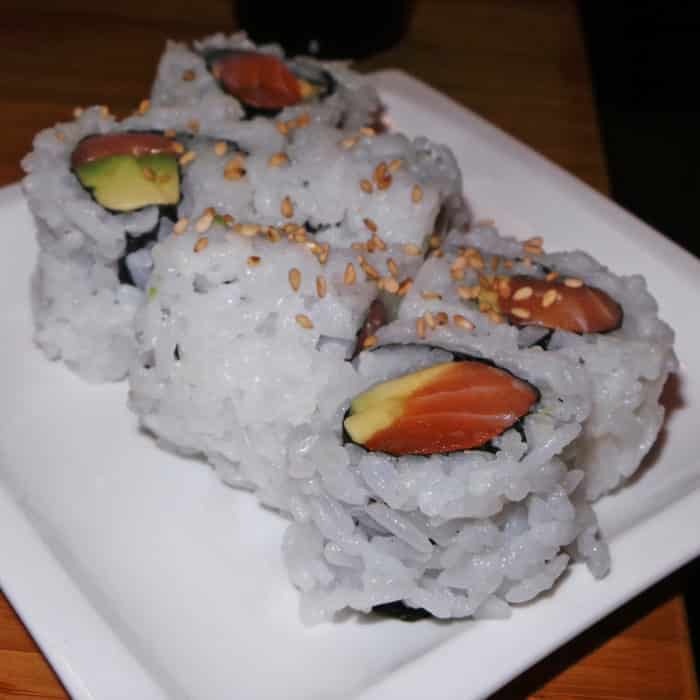 We finished out our meal with a six-piece Arctic Char and Avocado Roll which was filled with a generous cut of that same wonderful arctic char we had with our Tataki Deluxe platter. The fish was great, the rice was great, and the avocado was great. It was simple and it was also perfectly executed. Hard to complain with this one. So even though the restaurant was very small and seemed to be constantly running at a frantic full-speed, I was definitely impressed by everything they did. 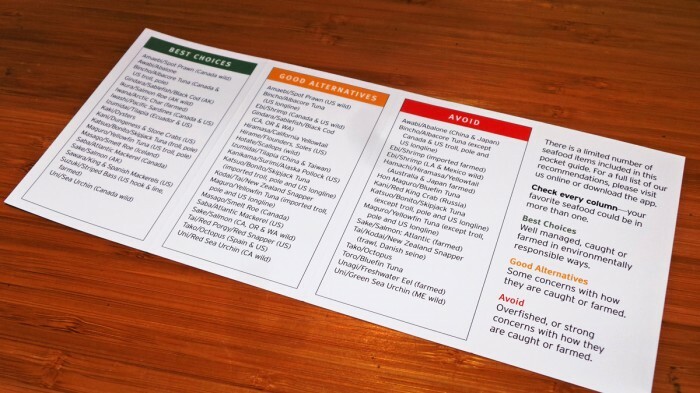 I went into the meal as a sustainable sushi skeptic, but now I know that it really does taste just as good, if not better than the non-sustainable alternative. 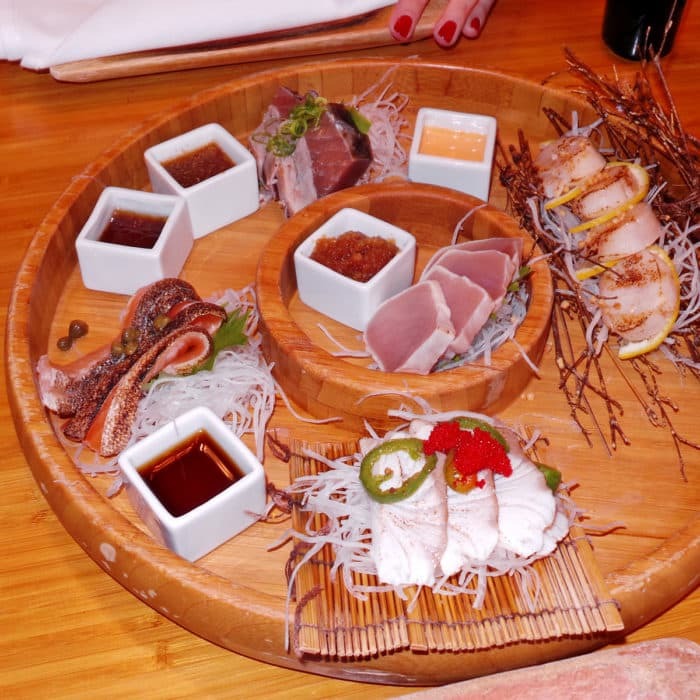 If you’re looking for a new sushi date night spot that’s a little different than your usual, give Tataki a shot. It’s bound to impress. Got another socially responsible eatery in SF that really is delicious that you think I should check out? Let me know in the comments below.